Oktoberfest: a time for beer. And sure, sausage, too. Here to provide some answers: Döner Bistro, a fast-casual haven of Germanic food and drink, soft-opening tomorrow. Picture a giant tent teeming with Bavarian flags, wooden tables and lederhosen. This is not that. No, this is a tiny, dark café where you can get a restorative snack during happy hour, or retreat for some après-beer-tent festivities (they’re open until 3am on weekends). Your communal tables: salvaged from Germany after last year’s Oktoberfest. Your entertainment: a foosball table, along with a mélange of German pop that may or may not include German rap (hint: it may). 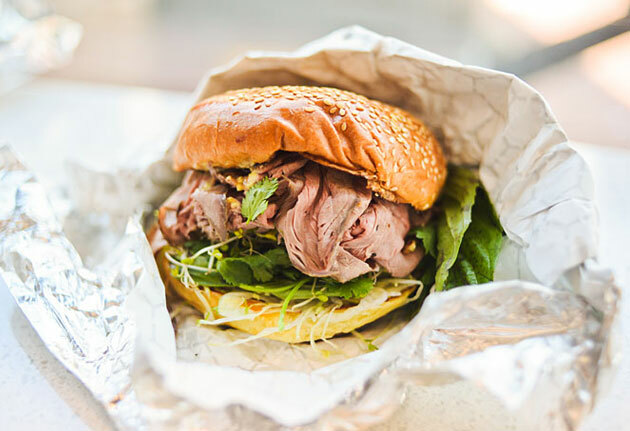 Of course, you’ll want to try the namesake food here—rotisserie-cooked beef or chicken on hot flatbread. But might as well throw in some fresh pretzels and potato cakes, schnitzel sandwiches and slices of brats with curry ketchup. Oh, and you’ll choose from 34 German and Austrian beers in the bottle, and another three on tap, with which they’ll fill up a giant one-liter mug that you can bring back for refills anytime. Or just use your giant beer boot.